We’ve got gobs of unforeseen events to be analyzed… from players unexpectedly producing and others that can’t find a rhythm. Welcome back to another week of Fantasy basketball! This week in the NBA: Houston and San Antonio continued to struggle in the West; Kevin Durant expressed interest in bringing an NBA team back to Seattle; and Allen Iverson weighed in on the Michael Jordan vs. LeBron James G.O.A.T. debate. 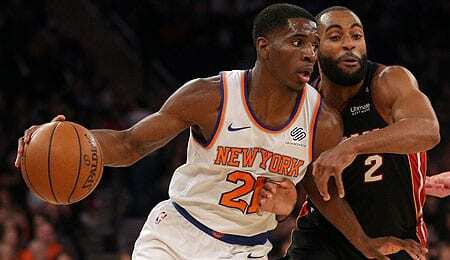 Damyean Dotson, SG/SF, New York Knicks (ESPN: 1.1 per cent; CBS: 28 per cent): Dotson’s been a beast off the bench since getting back into the regular rotation. He’s had one poor game in which he scraped together a measly five points, but has otherwise been a tremendous success for the Knicks, scoring between 16 and 21 points per game (see video below for his 21-point explosion). Along with the scoring, Dotson has shown an ability to rebound and come up with steals. Trade rumours of him taking a short – but permanent – trip to Brooklyn (or perhaps Detroit?) make him one to keep a close watch over. If you can only afford one move this week, Dotson is your man. He’s gifted with good size for a two-guard and has some serious wheels. Justise Winslow, SF, Miami Heat (ESPN: 1 per cent; CBS: 39 per cent): The 2015 NCAA Champion has been scoring, rebounding, dropping dimes and – over the last week – averaging a block a game. On both Friday and Saturday, Winslow put up monster lines, flirting with triple doubles in each. He has potential to get double-doubles, but don’t count on them being a regular occurrence. Despite coming off the bench most of the time, Winslow is trusted with solid minutes (28.4 per game) and is likely to produce decent numbers on a consistent basis. Allen Crabbe, SG/SF, Brooklyn Nets (ESPN: 1 per cent; CBS: 26 per cent): The Crusty Crabbe exploded with seven treys against OKC on Wednesday, following that up with eight more over the next two games. Another pick up with high minutes (32 MPG over the last five), Crabbe has been feeling it from behind the arc. His three point and field goals percentages are nothing to be ashamed of considering literally all the man does is shoot threes. Crabbe is a mediocre rebounder and defender who will not help you any categories other than the percentages, three pointers made and points. If he keeps shooting anywhere near this level, his value will increase significantly. Jakob Poeltl, C, San Antonio Spurs (ESPN: 0.9 per cent; CBS: 7 per cent): Even though he was completely posterized by Lonzo Ball On Wednesday, with Pau Gasol still out, the former Raptor is stepping up. Poeltl scored a career high 20 points against the Jazz to go along with seven rebounds. He’s an excellent shot blocker with huge upside if he can retain about 20-to-25 minutes per game. Richaun Holmes, C, Phoenix Suns (ESPN: 0.1 per cent; CBS: 17 per cent): The big man recorded a double-double on Tuesday and had 15 points and four blocks last Sunday. The sad squad in Phoenix will take production from anyone who can muster it. A recent jump in minutes from a season average of 13.8 minutes to 20.5 minutes over the last week has seen Holmes go from a grungy pickup to an acceptable snag. Carmelo Anthony, PF/SF, Houston Rockets (ESPN: 30.7 per cent; CBS: 32 per cent): Surprised to see Melo here? You should be. The Lakers reportedly have “no interest” either… along with the rest of the NBA. The 10-time All-Star should not be owned in any standard league. Even in deep leagues using up your IR on the gamble that Anthony comes back and plays like himself is foolhardy. His ownership on ESPN is laughable. Owners are keeping him on their rosters for sentimental value. If your reason for being involved in Fantasy basketball is to have a pretty list of players you like, then by all means, grab Anthony and have fun losing. The rest of us will thank you. If you like jazz-funk, why not try some Polish funk on for size? Gramine put together a couple of albums in the early 1970s, and here’s “Osiem Koni Albo Czterdziestu Ludzi” from its second and eponymous album, released in 1974. This gold cannot be lost to the ravages of time! Your turn! Let us know who your favourite Fantasy basketball pickup of the week is in the comments below.